Pineapples and Crowns Quilt Top is Finished | OccasionalPiece--Quilt! Posted on April 7, 2015 by Elizabeth E.
I finished appliquéing all the leaves for the pineapple crowns, as I like to think about it (thanks to Brenda, a reader of this blog), and sewed on the borders. Happy to be at this place. If I really push myself, potentially creating more stress than I’ll know what to do with, I could try and get this quilted and bound by our next guild meeting in two weeks, where we are showing off our 50/50 quilts challenge: finishing off UFO quilts that were more than 50% finished. If all of sudden this blog goes dark, you’ll know what happened: I killed myself off. More blog posts about this quilt are here and here and here, or use my handy-dandy search box to the right (it really works). The tutorial to make the pineapple block, using paper-pieced method, is here. I may change the name, but I’m trying this one out for a while. Occasionally my blog software puts ads below my posts, so I can blog for free. I do not control the content, nor the frequency. Congratulations on the finish! It is truly one of the happiest, dancing-est quilts I’ve seen – a little like Snoopy kicking up his heals in glee. And I sense that’s how you feel about it at this point, too! Good job! I love everything about this quilt top Elizabeth- the applique border really sets off the blocks, and even the name adds that other layer! Good luck with getting it quilted- you can do it! This is such a pretty quilt top, Elizabeth! You’ve done such a great just of choosing colors and prints that make me want to just sit and study it for a while. Very eye-catching. I don’t think this will take too much effort to quilt as there’s so much going on, that minimal quilting will be best. Are you quilting it yourself? I hope so, as I know you’re gifted in that way too. One of my all time favorites Elizabeth – and that is even before it’s quilted. You are so creative. It’s lovely and I look forward to seeing it quilted and finished. But don’t make it a quilt that created a lot of stress, just see what you do or don’t do as you go along. 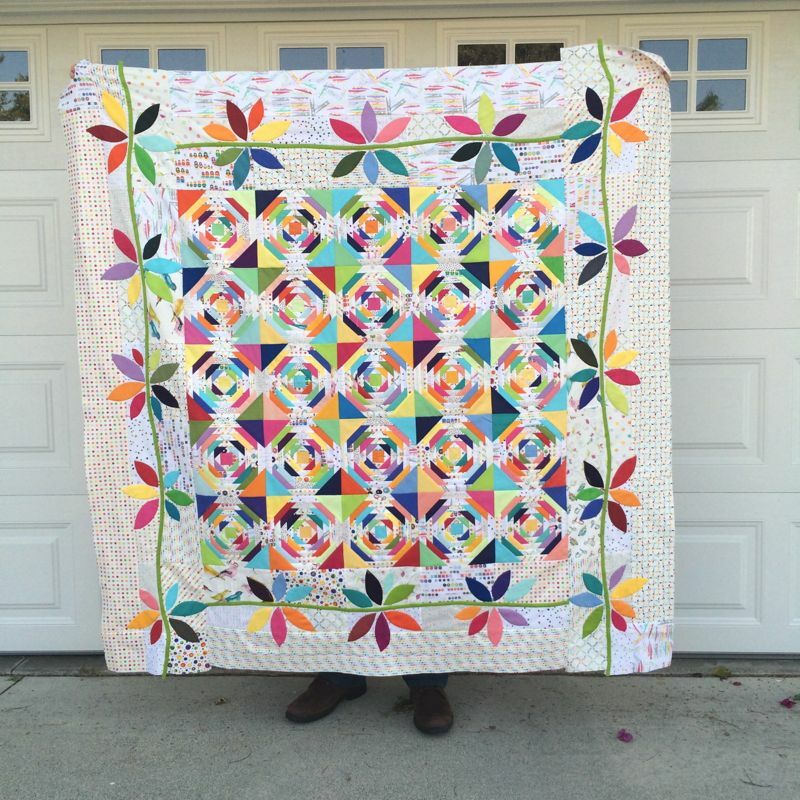 I love it–such a fun and happy quilt!! This is such a lovely quilt. I would never have had the patience to attempt that border! But it really sets off the pineapple blocks so perfectly. You have wonderful color choices, and I love how the border turned out. That is really gorgeous. I can’t wait to see what you do with quilting it. I don’t need to repeat myself, but I do like how this quilt has evolved. Like your name — better than Double Pineapple. The quilt is so gorgeous! You do deserve a rest – but just for some much needed sleep to restore your reserves! hmmm . . . i thought for sure I had already commented. The petal border is just perfect for the pineapple blocks. It feels so tropical and is certainly making me wish I was on a beach somewhere. Well done. A bright and beautiful quilt quilt made all the more special with that applique border. Congrats, Elizabeth! I love the variety of colors in the triangles between the pineapples! Very beautiful. That quilt LOOKS like all the work that went into it! Very nice.